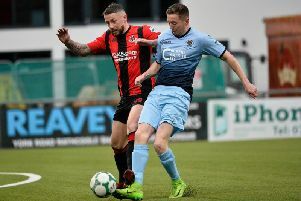 Institute manager Kevin Deery believes the last minute heartbreak suffered by his side in last season’s promotion play-off in Ballinamallard will help spur the Drumahoe men to victory in tonight’s winner takes all second leg tie against Carrick Rangers. The Championship One outfit travel to the Belfast Loughshore Hotel Arena for this evening’s second leg promotion playoff shootout knowing one more victory would ensure they will be mixing against the likes of Linfield, Crusaders, Coleraine and Cliftonville in the 2017/18 Dankse Bank Irish Premiership campaign. And after last Tuesday night’s 1-1 draw at the Riverside in the first leg, the tie is evenly poised. “We were in a much worse position last season after losing the game at home but now we know what’s required, we have to go away and win,” Deery admitted. “Yes I know anything better than a 1-1 draw suits us, but the way I’m looking at it is a win and you are in the Premiership. A lot of teams have gone there and won, so why not believe that you can’t go up there and win. Deery was disappointed that his side aren’t taking a first leg advantage into tonight’s clash, but he remains upbeat. “We want to win every game we play, we didn’t but it’s not a disaster by no means. I have told the players if we win on Friday night we are in the Premiership, what more could you ask for? “Look, if anyone had told me that at the start of the season you have to go away to Carrick and win a match to get into the Premiership, I’m pretty sure most of us would have said ‘let’s go’”. Going into tonight’s clash both Stephen Curry and Raymond Foy are both missing, but Ryan Morrow may return to the squad. “It’s a blow for us, Stephen pulled his calf very late in the warm-up, while Raymond has an ankle problem, but other players have to step up now and do their work for them,” he added.